Football birthday party ideas for kids, teens and adults. 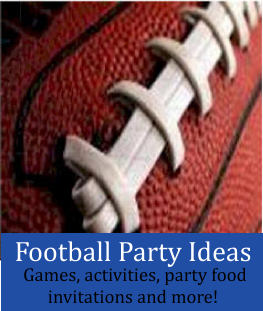 Great ideas for party games, football themed food, decorations, invitations, activities and more. Great for Super Bowl watching parties too! Games to play during the football game and during half time. Use our quick and easy Rooter Pom Pom video for directions on how to make do-it-yourself Rooter pom poms for decorations or for cheering on your favorite teams! Divide up into teams of 2 and have players stand 20 feet from their partner. Have the teammates toss the football back and forth. Once they both have caught the ball make all the teams back up 10 feet. If a team misses then they are out. The team who can successfully throw the football back and forth the farthest distance wins. These can be played outdoors with a regular football or indoors with a Nerf style. There are different ways to set up an accuracy contest - try one or all of them for more fun. Hang a hula hoop from a tree with string. Have guests stand back 20 feet and try and throw the ball through the hoop. The guests who can accomplish this get another turn - but have to move back 10 feet. The winner is the guest who can accurately throw the ball the farthest. Or give each player 5 tries to make it through the hula hoop. The player with the best accuracy wins. Give bonus points when the ball doesn’t touch the hoop. Set up 3 laundry or bushel baskets 10 feet apart. Line up guests 10 feet from the first basket. Give points to each basket - 1st basket is worth 1 point, 2nd - 2 points, 3rd - 3 points. Give each player 5 turns to see who can get the highest score. Set up 10 bottles or cans pyramid style on a small table and have guest stand 20 feet away. The guest who can knock over the most bottles wins. You can play several rounds and add up the scores for more fun. This can also be played by setting up just one can and seeing who can hit the can from a distance. For a real challenge after the players have completed these accuracy drills have them play again only this time have them try while blindfolded or with their back turned. Set up two baskets or buckets about 7 feet apart and have a kicking contest to see who can kick the football through the “goalposts” - best out of 5 tries wins. Choose one or two words that if said will cause the person to be penalized. Buy cheap whistle necklaces and give one to each party guest. Instruct the guests that they are not allowed to say the word ________ . If they do the person who catches them will take their whistle. Make the taboo word or words fun and something that would be used a lot at a football game such as “ball”, “first down”, “touchdown”, “referee” or for more fun let the teams name, head coaches name or quarterbacks name be the taboo word. If you want to make it a lot of fun for the younger kids make small yellow squares of felt or cloth and give one to each guest. When they catch someone saying the taboo word have them thrown their flag and call a penalty. Play the game of charades using football or Super Bowl terms. Divide guests into 2 teams. Before the game list several football related words on folded cards and put them in a bowl. The first team will choose 1 player from their team to pick a card out of the bowl. Without showing the term to their team they must act out the word. Give the team 1 minute to guess the word. If they can’t guess then the other team gets an opportunity to steal with just 1 guess. After the word has been solved move on to the next team. Here are a list of some football related words. Add your own to make the list as long or as short as you want. If you are watching the Super Bowl (or another game) play a Football Bingo game. Create a 5 x 5 grid on cardstock. Make the center square a FREE space. Give everyone peanuts, pennies or markers to keep track of their Bingo score. On the squares randomly place the following terms - making sure that no two cards are the same. First player to cover the spaces on their card either across, down or diagonally wins a prize such as a foam finger, jersey or team item. Play a game of flag football using bandanas as the flags. The same rules of football apply, however there is no tackling allowed. To tackle a player removes another players bandana from their back pocket. Monkey in the middle is one of our families favorite games. You can play it with as few as 3 people and all you need is a football - or any type of ball. Choose who will be “it” and then all the other players make a circle around “it” keeping about 10 feet between them. The players on the outside throw the ball across the circle to another player and the “Monkey” tries to catch the ball. When they catch the ball they take the place of the person who threw the ball and that person becomes the new “Monkey”. Paint the birthday guests faces in the colors of your favorite team to get them all in the football spirit. Serve everything you would find at a football game. Buy a football cookie cutter to make football shaped food. Ideas for football food shapes are Cheese, cold cuts, bread, cookies, brownies, mozzarella cheese for pizzas and slices of fruit. Make football invitations for the party using cardstock and some imagination. Football Invitations - Take a piece of brown card stock paper and fold in half to make a card. Trace a football shape onto the cardstock card. Make sure that the top of the football is on the cards fold. When cut the football will connect at the top fold. With a hole punch make holes near the top and insert a white shoe string or plastic laces into the holes. On blank note cards paste football trading cards and/ or football pictures from a magazine of the birthday child's favorite team - or find a player or players jersey numbers that match the birthday child's age and inside the invitation write "The NFL is celebrating ______'s birthday - why not join us?! You can also make a football jersey cut out just like the football card example above. Use card stock in your teams colors and draw or use stickers to put the number (or last name) on the jersey that matches your child's age. Create a Football or Event type ticket with the birthday child's name as the Main event. There are many types of football tickets - make a mock copy of your child's favorite teams ticket. Check Flickr for examples. Not crafty? There are many online stores that sell Event Ticket theme invitations. Use your football teams' favorite colors to decorate party. Helium balloons, streamers, pom pom and team signs along with team posters on the walls are easy and will make the football party look festive. Using butcher block paper make a large banner that the kids can run through - paint it like a run through sign with the child's name and age and a fun slogan like "Busting through to #10 (for a 10th birthday). Cover food tables with a green plastic table cloth to make them look like football fields and then use pin striping white tape to make the yard lines. You can also do this as a fun way to welcome guests to your party by covering the walkway to your front door with green tablecloths and making it a field they have to walk over to get into the party. Use tape on the back to secure it to the walkway. Serve food in plastic football helmets or football shaped bowls. Goal posts can be made fairly easily out of colored tissue paper. Unfold the tissue paper and then twist into long tubes. Add several together to get the length you need for your goal post. A fun and easy idea for a football party is to serve the food 'tailgate" style. Set up barbeque grills in the backyard and cook hot dogs and hamburgers. Have the parents and adult helpers wear white and black referee shirts.